Blending practicality and style, the Audi A6 is an executive vehicle that has no trouble standing apart from the crowd. Stylish looks and a well-equipped interior come as standard, and the model's impressive lineup of powerful and efficient engines help to ensure the A6 is a serious contender in its field. 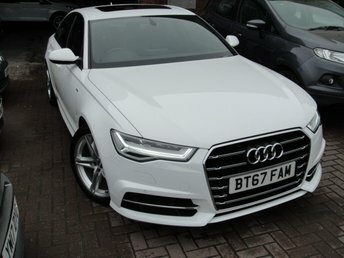 For a great deal on a used Audi A6 for sale in Aveley, South Ockendon, Romford be sure to speak to a member of the team at Premier Cars today. You'll find our complete range listed here on the website and it's simple to arrange a test drive in the vehicle of your choice simply by contacting a member of the showroom team. Finance is available to UK residents aged 18 years or older, subject to status. Terms & Conditions apply. Indemnities may be required. Other finance offers may be available but cannot be used in conjunction with this offer. We work with a number of carefully selected credit providers who may be able to offer you finance for your purchase, commission may be received. We are only able to offer finance products from these providers. Postal Address: Premier Cars, Millennium House, Unti 21-23 Juliette Way, Purfleet, Essex RM15 4YD. Find contact details here. Premier Cars is authorised and regulated by the Financial Conduct Authority, FRN: 665273. All finance is subject to status and income. Written Quotation on request. We act as a credit broker not a lender. We work with a number of carefully selected credit providers who may be able to offer you finance for your purchase. We are only able to offer finance products from these providers.